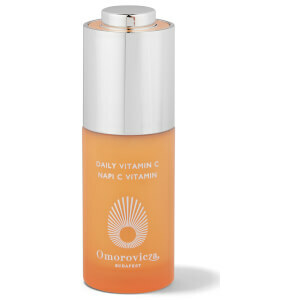 Defend against the ageing effects of external aggressors using the Omorovicza Anti-Pollution Treatment. The must-have set contains a pair of serums that work to hydrate, strengthen and protect skin for radiant and youthful results. A multi-purpose serum ideal for damaged, dull and oily skin. The formula aims to treat the damage caused upon skin by UV radiation, environmental toxins and acne, utilising the brand’s patented Healing Concentrate™ delivery system to strengthen the skin surface, leaving it plumper, firmer and smoother. A potent trio of Glycolic, Salicylic and Lactic Acids works to remove dead cells, create a more even skin tone and reduce the appearance of fine lines and wrinkles for a more youthful complexion. Australian Caviar Lime Extract restores radiance and softens the complexion, while Sodium Hyaluronate replenishes and retains hydration to erase dryness. A potent brightening treatment that helps to combat the common signs of ageing. A stabilised form of the powerful antioxidant Vitamin C creates the basis for this milky serum, helping to defend against environmental aggressors whilst balancing pigmentation for a more unified skin tone. Melting in effortlessly, the formula also utilises Hyaluronic Acid to pump the akin full of moisture for a lasting hydrated effect, while the brand’s exclusive Healing Concentrate™ firms and tones the facial contours whilst smoothing the appearance of fine lines and wrinkles. Acid Fix: At night, apply two to three drops after your evening cleanse, follow with your usual moisturiser. Use 2 -3 times weekly. Slight irritation may occur and indicates the product is working. When using acid products, always avoid sun exposure. Vitamin C: Apply Am and PM before your moisturiser. Vitamin C: Aqua (Hungarian Thermal Water), Glycerin, Propanediol, Sodium Ascorbyl Phosphate, Alcohol, Yeast Extract, Sclerotium Gum, Sodium Levulinate, Alcohol Denat., Niacinamide, Sodium Anisate, Xanthan Gum, Zinc Pca, Potassium Sorbate, Citric Acid, Caprylyl/Capryl Glucoside, Benzyl Alcohol, Parfum (Fragrance), Ci 77891 (Titanium Dioxide), Chlorella Vulgaris/Lupinus Albus Protein Ferment, Nasturtium Officinale Flower/Leaf Extract, Sodium Hyaluronate, Phospholipids, Leuconostoc/Radish Root Ferment Filtrate, Sodium Benzoate, Actinidia Arguta Fruit Extract, Limonene, Linalool, Benzyl Salicylate, Citronellol, Geraniol.